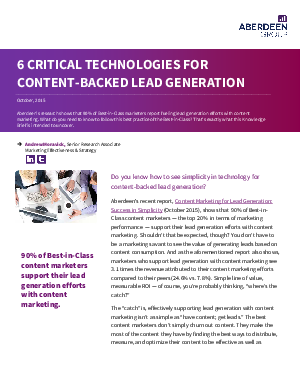 Do you know how to see simplicity in technology for content-backed lead generation? Aberdeen’s recent report shows that marketers who support lead generation with content marketing see 3.1 times the revenue attributed to their content marketing efforts compared to their peers (24.6% vs 7.8%). Simple line of value, measurable ROI – of course, you’re probably thinking, “where’s the catch?” The “catch” is, effectively supporting lead generation with content marketing isn’t as simple as “have content; get leads.” The best content marketers don’t simply churn out content. They make the most of the content they have by finding the best ways to distribute, measure and optimize their content to be effective as well as efficient in how it produces leads. And to achieve that kind of comprehensive content marketing, marketers need technology.